NEW DELHI: Nifty futures on the Singapore Exchange were trading 33 points, or 0.29 per cent, higher at 11,507, indicating a positive start for the Nifty50. Here are a few stocks which may buzz the most in today’s trade. Mindtree: Larsen & Toubro (L&T) is planning to sign a deal with Café Coffee Day founder VG Siddhartha to buy his 21 per cent stake in Mindtree and launch an open offer for an additional 31 per cent stake in the IT company, probably as early as Monday evening. Dish TV: As Mukesh Ambani’ Jio has taken control of the two largest cable operators – Hathway Cable & Datacom and DEN Networks — Airtel’s Sunil Mittal has initiated talks with Dish TV, to merge his DTH business, housed under AirtelNSE -0.65 % Digital TV. Jet Airways: Lenders have told Jet’s strategic partner Etihad Airways that if it is unable to accept the terms to revive the troubled airline, it should exit so that a new investor can be brought in. Etihad, saddled with losses and unsure of the resolution plan and its probable outcome, is understood to have said that it could exit at a price of Rs 150 a share. Bandhan Bank, Gruh Finance: The lender’s proposed acquisition of HDFC-owned Gruh Finance could face regulatory scrutiny, with the central bank saying that HDFC, the country’s home-financing pioneer, could hold only 9.90 per cent or less in Bandhan after the deal. DHFL: The WGC Group company will exit Avanse Financial Services by selling its entire 30.63 per cent stake in the company . Lupin: The drug major Lupin said it has been cautioned by the US health regulator that its Somerset (New Jersey) facility may be subject to regulatory or administrative action and that it may withhold approval of any pending applications or supplements in which this facility is listed. United Breweries, SBI: The State Bank of India (SBI), one of the lead lenders to Vijay Mallya’s businesses, has moved the Karnataka High Court to seek rights over a 2.8 per cent stake, worth Rs 1,025 crore, in beer maker United Breweries (UBL) held by a courtappointed liquidator. RCom: Reliance Communications (RCom), which must pay Rs 453 crore to Sweden’s Ericsson by Tuesday to save chairman Anil Ambani from a Supreme Court-ordered jail term, is facing more legal woes over pending payments. Lakshmi Vilas Bank: Private sector lender Lakshmi Vilas Bank has raised Rs 460 crore in a share sale to multiple investors, helping it shore up its rickety finances and escape the customary straitjacket restricting operational freedom. DLF: Realty major DLF will invest around Rs 750 crore for construction of a new commercial project in Gurugram, sources said. The company has decided to build a new project with 2.5 m sq ft area. It will sell office and retail space in this project, and not adopt lease model, sources added. Embassy REIT: India’s maiden Real Estate Investment Trust (REIT) issue by Embassy Office Parks has already seen over 55 per cent subscription though the issue opens on Monday. This is the first-time ever a public issue has witnessed more than half of its size being picked up by investors before the issue opens. The issue will be opened for investors on Monday. • Jefferies has downgraded Bharti Airtel to underperform from hold and cut target price to Rs 270 from Rs 280. Bharti Airtel’s stock has rallied 12 per cent in past 5 days as promoters pledged to subscribe in rights issues aiding balance sheet, said Jefferies. The funds raised though highlight that competitive intensity would remain high in near term, it said. • Edelweiss has maintained a buy rating on Jindal Stainless and revised target price to Rs 65 from Rs 40. In the past one year, the stock has exhibited greater volatility than both peers and LME nickel owing to concerns around pledging of promoters’ shares and delay in exit from the CDR mechanism, said Edelweiss. • Motilal Oswal has maintained a buy rating on LIC Housing Finance with a target price of Rs 600. After a span of two years, the business environment is turning favourable for LIC Housing Finance, said Motilal Oswal. With liquidity tightening, the brokerage expects players with stronger parentage to disproportionately benefit versus peers. With steady to improving core home loan growth, stable spread and asset quality, LIC Housing Finance is set to deliver 1.5 per cent RoA and 16 per cent RoE over the medium term, it said. • CLSA has downgraded the stock of TTK Prestige to sell from buy with unchanged target price of Rs 9,000 citing fair valuations. Valuations at 46 times one-year forward earnings adequately reflect growth visibility ahead and leave little room for further upside, said CLSA. However, a higher-than-expected ramp-up in export orders and/or rollout of government tenders for induction cooktops could be a key upside risk going forward, the brokerage said. • IIFL has downgraded Bharat Forge to reduce with a target price of Rs 460. FY20 may mark a cyclical peak in Bharat Forge’s revenue and earnings, said IIFL. The brokerage expects growth to decelerate sharply and, possibly, even decline in FY21. The downturn would be a result of sharp drop in India and US CV segments, which account for 36 per cent of standalone revenues, said IIFL. Alembic Limited: Nirayu Private Limited has bought 1,76,581 shares through Market Purchase from Mar 12, 2019 to Mar 13, 2019. Bajaj Auto Limited: Bajaj Holdings & Investment Limited has bought 6,28,437 shares through Market Purchase from Mar 12, 2019 to Mar 14, 2019. Crest Ventures Limited: Fine Estates Private Limited has bought 25,000 shares through Market Purchase on Mar 13, 2019. Gyscoal Alloys Limited: Viral M Shah has bought 3,00,000 shares through Market Purchase on Mar 13, 2019. Jindal Stainless Limited: Abhyuday Jindal has bought 70,000 shares through Market Purchase on Mar 13, 2019. Kabra Extrusion Technik Limited: Anand Shreevallabh Kabra has bought 15,547 shares through Market Purchase on Mar 12, 2019. Ramgopal Polytex Limited: Ramgopal & Sons has bought 2,03,500 shares through Inter-se-Transfer on Mar 13, 2019. S H Kelkar and Company Limited: S H Kelkar Employee Benefit Trust has bought 1,28,130 shares through Market Purchase from Mar 11, 2019 to Mar 12, 2019. Srikalahasthi Pipes Limited: Uttam Commercial Company Limited has bought 28,847 shares through Market Purchase from Feb 18, 2019 to Mar 13, 2019. Tokyo Plast International Limited: Priyaj Haresh Shah has bought 20,162 shares through Market Purchase from Mar 6, 2019 to Mar 12, 2019. Yes Bank Limited: Hemant Kumar Batra has bought 38,304 shares through Market Purchase from Oct 1, 2018 to Feb 28, 2019. Avanti Feeds Limited: Thai Union Asia Investment Holding Ltd has sold 1,36,937 shares through Market Sale on Mar 13, 2019. Axis Bank Limited: The Oriental Insurance Company Limited has sold 20,000 shares through Market Sale on Mar 12, 2019. B. L. Kashyap and Sons Limited: Naresh Lakshman Singh Kothari has sold 1,90,000 shares through Market Sale on Mar 13, 2019. HDFC BankNSE 0.50 % Limited: Ashok Khanna has sold 30,000 shares through Market Sale from Mar 13, 2019 to Mar 14, 2019. HDFC Bank Limited: Kaizad Maneck Bharucha has sold 70,000 shares through Market Sale from Mar 13, 2019 to Mar 14, 2019. HDFC Bank Limited: Nitin Chugh has sold 37,000 shares through Market Sale from Mar 13, 2019 to Mar 14, 2019. HDFC Bank Limited: Parag Rao has sold 26,000 shares through Market Sale from Mar 13, 2019 to Mar 14, 2019. HDFC Bank Limited: Paresh Sukthankar has sold 35,000 shares through Market Sale from Mar 13, 2019 to Mar 14, 2019. HDFC Life Insurance Company Limited: Rajendra Ghag has sold 45,000 shares through Market Sale on Mar 11, 2019. Housing Development Finance Corporation Limited: Amit Joshi has sold 17,000 shares through Market Sale on Mar 13, 2019. Indusind Bank Limited: Zubin D Mody has sold 20,000 shares through Market Sale on Mar 13, 2019. Indusind Bank Limited: Romesh Sobti has sold 1,00,000 shares through Market Sale on Mar 13, 2019. Info Edge (India) Limited: Ambarish Raghuvanshi has sold 32,646 shares through Market Sale on Mar 13, 2019. ITC Limited: Ashwani Kumar has sold 34,000 shares through Market Sale on Mar 13, 2019. ITC Limited: Neel.K. Jasper has sold 30,000 shares through Market Sale on Mar 12, 2019. ITC Limited: Rajiv Tandon has sold 15,000 shares through Market Sale on Mar 13, 2019. Jubilant Foodworks Limited: Jubilant Consumer Private Limited has sold 39,59,071 shares through Market Sale on Mar 14, 2019. L&T; Finance Holdings Limited: Manoj Shenoy has sold 1,00,000 shares through Market Sale on Mar 13, 2019. Mahamaya Steel Industries Limited: Ramanand Agrawal Huf has sold 20,000 shares through Market Sale on Mar 12, 2019. Minda Industries Limited: Jai Kumar Menon has sold 15,613 shares through Market Sale from Mar 12, 2019 to Mar 13, 2019. Minda Industries Limited: Naveesh Garg has sold 20,000 shares through Market Sale from Mar 12, 2019 to Mar 13, 2019. Ramgopal Polytex Limited: Sanjay Jatia has sold 2,03,500 shares through Inter-se-Transfer on Mar 13, 2019. RBL Bank Limited: Mayur Arunkumar Shah has sold 16,000 shares through Market Sale on Mar 11, 2019. 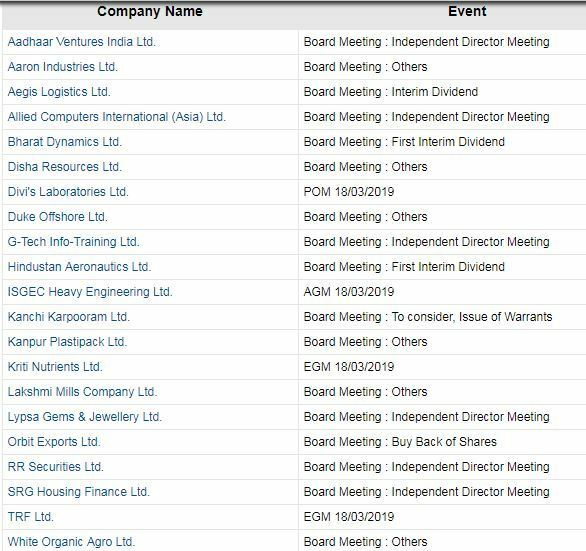 Sun Pharmaceutical Industries Limited: Jayant S Sanghvi has sold 5,00,000 shares through Market Sale from Mar 11, 2019 to Mar 13, 2019. Yes Bank Limited: Deodutta Raghunath Kurane has sold 50,000 shares through Market Sale on Mar 13, 2019. Yes Bank Limited: Hemant Kumar Batra has sold 37,204 shares through Market Sale from Oct 1, 2018 to Feb 28, 2019. Yes Bank Limited: Rajat Monga has sold 5,00,000 shares through Market Sale on Mar 12, 2019.